The renovations began right after the first of the year. 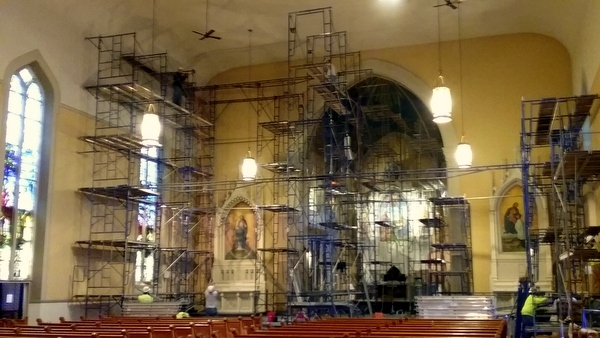 After two weeks of renovations, Holy Family church is full of scaffolding and the sanctuary ceiling and walls have been cleaned, repaired, and repainted. The paintings in the high altar reredos have been removed for cleaning and repair. Some hidden stained-glass windows were uncovered and will add beauty and light to the sanctuary. The wall colors and highlights have been chosen and soon the ceilings will start to be painted and stenciled. It's coming together. Tomorrow we begin, “Week of Prayer for Christian Unity,” January 18 to 25, during which time we pray and work for the unity of all who believe in Christ as our Savior. Jesus’ prayer is that we all be one, unified in our belief in Him, and not divided into many denominations, all claiming to be the one, true church. May God help us to overcome our divisions. 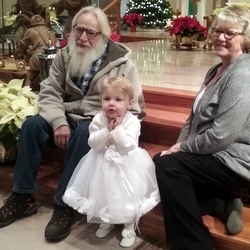 We were blessed last week on the Feast of the Baptism of the Lord to celebrate the Baptism of Aubrey Jane Laker, daughter of Kyle and Emily (Fledderman) Laker. 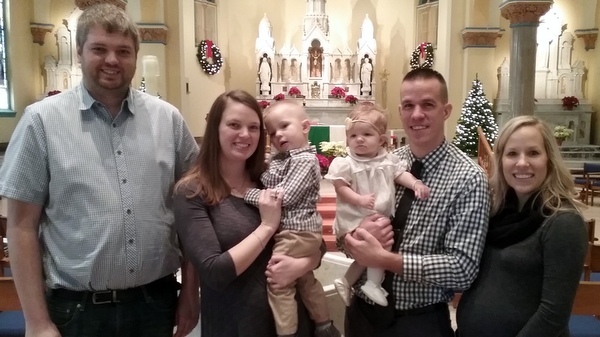 The previous week we celebrated the baptism of Charlie Grace Kernodle. We are challenged to grow ever deeper in our appreciation of the gift of Baptism, and to live out our commitment to be followers of Jesus in all our daily activities and relationships. As we move into Ordinary Time once again, the prophet Isaiah reminds the Jewish people of God’s great love and care for them. St. Paul tells the Corinthians and us about all the gifts that God is giving to various individual people through his one Spirit: service, wisdom, knowledge, faith, healing, mighty deeds, prophecy, discernment of spirits, varieties of tongues, and interpretation of tongues. St. John presents Jesus’ first sign, the changing of water into wine at his mother’s request at the wedding feast of Cana. Fr. Carl Langenderfer, OFM, is pastor of Holy Family Parish in Oldenburg, Indiana. Aubrey Jane with brother, godparents, and parents Kyle and Emily Laker at her baptism on the Feast of the Baptism of the Lord.